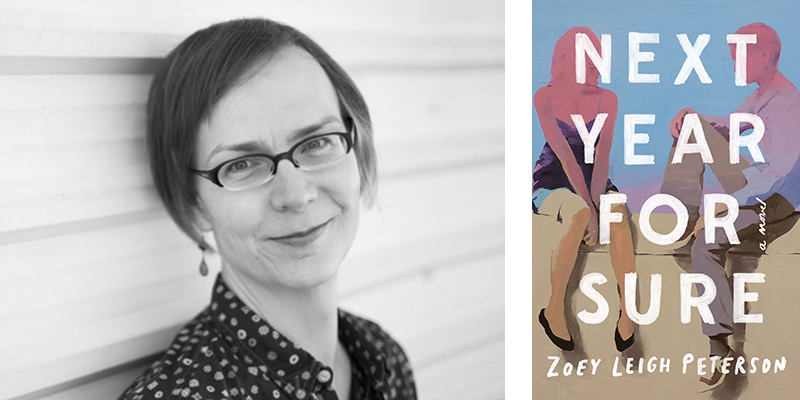 Powell's Q & A: Zoey Leigh Peterson, Author of "Next Year, For Sure"
When people ask what Next Year, for Sure is about, I say it’s about a lot of things. It’s about a couple who stumble into polyamory. It’s about friendship, and particularly the pain of ending a friendship. It’s about the secret sadness of a seemingly happy couple. It’s about the challenge of growing and changing within a relationship — platonic or otherwise. It’s about connections between people that feel too big to be called "friendship" but aren’t allowed to be called "marriage." And more than anything else, it’s about loneliness, the loneliness of adulthood, the loneliness of watching your lifelong friends disappear into their careers or families and leaving you bereft. I don’t know if it was my favorite, but I still remember the release of Superfudge, the much-anticipated sequel to Tales of a Fourth Grade Nothing. The school librarian knew I was obsessed with Judy Blume and told me that when the book came out, she’d let me be the very first one to borrow it. I’ve never waited for anything like I waited for that book. But then when it finally came, I realized that I’d only get to keep it for two weeks and then some other kid was going to want it. And instead of simply reading the book like a reasonable person, I decided to transcribe the entire book by hand, word by word, so that I could read it at my leisure. I spent the entire two weeks trying to render a perfect copy of the opening pages and then I had to give it back unread. I still haven’t read it. I have a little standing desk, but I tend to wander around my apartment with a legal pad and pen, perching to scribble down a word or two wherever they come to me. I spend a lot of time sprawled on the floor. Right now, it’s a bit more elaborate than usual because I’m working on another novel. 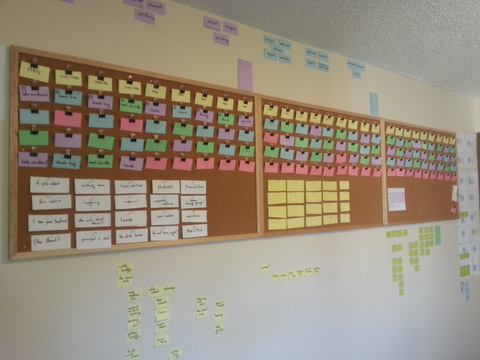 But even when I’m working on a short story, I really can’t think without a nice big wall covered in sticky-notes. I get really into things. Whatever I care about at any given moment, I probably care about that thing more than most of the people around me — Jungian psychology, heist movies, pin-hole photography, Quaker history, winemaking. That’s just my natural state. But usually only for a couple of months and then I’m on to something new. The one consistent thing is music. If I ever find myself in a room with two or three people who care about music as much as I do, I’m going to drop everything and start a band right then and there. Forget novels. One of the best experiences I’ve ever had with a reader was my eighth-grade English teacher, Mrs. Riley. One of the first assignments she gave us was to write a ghost story. We’d been studying Edgar Allan Poe in class, and I was devouring all of Stephen King outside of class, so I was pretty excited to try my hand at writing something terrifying. When I got my graded story back, there were all the usual corrections and comments in red ink, but then at the end of the story Mrs. Riley had attached several pages of handwritten notes detailing her reaction to the story. She wrote that she’d had to get up halfway through the story and turn all the lights on in her house. She said that she couldn’t go to sleep after she finished it because she was too scared. She walked me through the story scene by scene and told me how each scene had made her feel, how it had moved her, how it had worked on her. No one had ever done that for me. I’d been writing for years and got lots of praise for my writing, but no one had ever been moved by my writing and then told me exactly how they’d been moved. It changed everything. All I cared about for the rest of eighth grade was writing short stories for Mrs. Riley — scary stories, sad stories, funny stories. And every time, she would give me extensive notes about how the story made her feel. It was incredibly generous of her, and probably the single most important thing to happen for my writing. I don’t know why it embarrasses me, but I hate telling people that I’m face-blind. Sometimes when I do tell people, they think I mean that I’m just “bad with faces” the way some people are “bad with names.” Nope, I’m talking about an almost complete inability to recognize faces. Once, my best friend came up to me on the street and I couldn’t figure out who she was because she was wearing a new hat. I was married to her at the time. I recommend Rhonda Douglas to everyone. I think she’s more known for her poetry, but I’d say start with her new story collection, Welcome to the Circus. And in particular I’d suggest starting with the story called “God Explains the Collapse of the Cod Fishery,” which blows my mind with its goodness. Imagine if Grace Paley wrote a George Saunders story. It’s a little like that, but more like Rhonda Douglas. I used to be a sign language interpreter, which was an amazing job in two different ways. First, there’s the actual act of interpreting, which is the only thing I’ve ever done that lit up every single part of my brain at once. Cognitively, it is one of the most intense and exhilarating things I’ve ever experienced. And second, being an interpreter thrusts you into all these situations that you might never experience otherwise. One minute you’re in a closed-door meeting with a head of government, and the next you’re holding on for dear life while a deaf-blind teen takes jet-skiing lessons. There’s nothing quite like it. But now I’m a public librarian, and that’s pretty good, too. I live with an almost constant fear of wasting time. There’s the ongoing battle with distractions and procrastination, of course. But even when I am writing and writing well, I worry that I am somehow wasting time — that the paragraph I’m writing will be cut in the final book, that I should be writing a different book altogether, that the world will stop publishing books before I finish the one I’m writing. It’s not a healthy outlook, but I’m an incredibly slow writer with only so many years to live. I feel like I don’t have a minute to lose. Well for starters, if someone were going to write my biography, I would ask that they please don’t. I honestly can’t think of a worse fate than having a biography written about me. And that really does sum up my concerns and preoccupations, both in writing and in life. The questions that interest me are not the conflicts between good and evil, but the conflicts between good people trying to do the right thing as they see it. These five words have become a lodestar for my writing ever since. So maybe Good People Doing Their Best: A Misguided Biography. When we first got the automatic [garage] door opener I loved to roll under the door and clear it at the last second. It was fun to think I could be sliced in half if I made even one tiny tactical error, until my sister told me the door was designed to stop as soon as it made the slightest contact with any surface, even flesh. Thanks for ruining my fun. I remember the way her knees looked while she stood on the driveway saying to me as I rolled under the door, don’t let’s be the kind of family that fights about who gets to kill themselves next. That's from A Complicated Kindness by Miriam Toews. So much of what I love about Toews is in that passage — the humanity, the understatement, the lightness, the darkness. Share a sentence or passage of your own that you're particularly proud of. After you experience a work of art, you should ask yourself three separate questions, and in this exact order: First, what do you think about the work the artist made? Answer that before proceeding. Second, what do you wish they’d done differently? Answer fully, then proceed. Third, what will you make? I might be misremembering the three questions, but the idea of breaking down your reaction into separate categories — what you feel about someone else’s work, and then how you yourself would have done it — has maybe informed the way I read and write ever since. And if anyone out there knows what Godard actually said, please, please, please let me know! Write a question of your own, then answer it. And here’s the answer I keep coming back to: When I’m in the middle of writing a story, I always get really scared that I’m going to die. I start to worry about aneurysms and oncoming traffic, and I desperately don’t want to die — not until I finish the story I’m working on. It’s not that I actively want to die when I’m not writing a story, but I’m not scared about it. I’m sanguine. I think, “Death is part of life, so I might as well be ready and at peace with it.” Which is fine if you’re actually dying, but might not be the best way to live. I want to want to live. I want to cling to life. And being in the middle of writing a story is the only thing that gives me that desperate-to-live feeling. In the spirit of Superfudge, here are my top five favorite books that I’ve never read. I’ve owned this book for years and I believe that when I eventually read it, it will be one of my all-time favorites. But for now, I’m just savoring the title, like a seed I carry around with me without planting. There’s a story in this collection that is arguably my favorite short story of all time. It’s called “Children Are Bored on Sunday” and I have read it at least 30 times. Every time I read that story I think, “God, I want to read every story Jean Stafford has ever written,” and then I put the collected stories of Jean Stafford back on my shelf. I took a class with Lynda Barry once and hearing her talk about writing this book changed the way I write. (After years of trying to write it on a computer, she threw out the computer and wrote the whole book with a paint brush.) Someday I’ll read the book, or I won’t, but either way, it has shaped me as a writer. I’ve been wanting to read this book since it came out, but instead I’m reading all her other books and saving this one for the perfect moment. I actually have read this book, but I was 14 and understood none of it. All I knew is that it was probably the greatest book I’d read in my young life and that it was utterly wasted on me. I’ve been circling around it ever since, getting ready. Zoey Leigh Peterson was born in England, grew up all over the United States, and now lives in Canada. Her fiction has appeared in The Walrus, Grain, and PRISM international, and has been anthologized in The Journey Prize Stories and Best Canadian Stories. She is the recipient of the Far Horizons Award for Short Fiction (The Malahat Review) and the Peter Hinchcliffe Fiction Award (The New Quarterly). Next Year, for Sure is her first novel.